Yu-Gi-Oh! 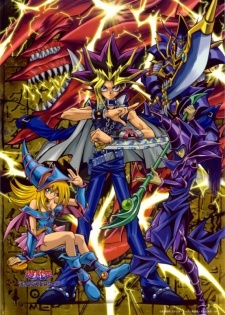 Duel Monsters centers around the journey of the spirit of an ancient Egyptian pharaoh who is trying to re-discover who he was many years ago, since he has lost his memories. With the help of a boy, Yugi Mutou, the one who awakened the spirit, and his friends, he battles many villains and adversaries. Many of the villains have been linked to the Nameless Pharaoh's past, due to the Millennium Puzzle he holds and many try to take the puzzle and his power away from him. The series focuses on the card game aspect of it and the main theme represented throughout the series is friendship.